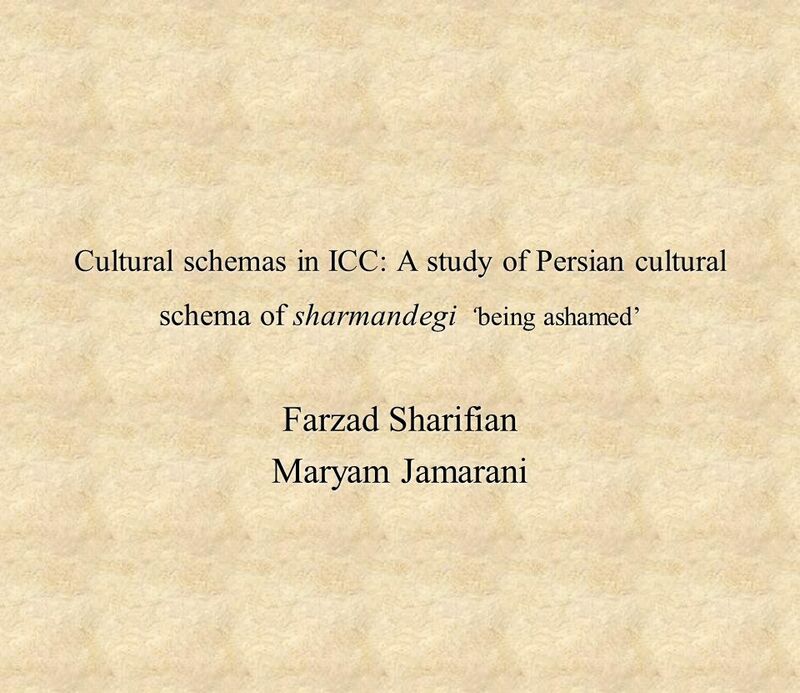 Cultural schemas in ICC: A study of Persian cultural schema of sharmandegi ‘being ashamed’ Farzad Sharifian Maryam Jamarani Farzad Sharifian Maryam Jamarani. 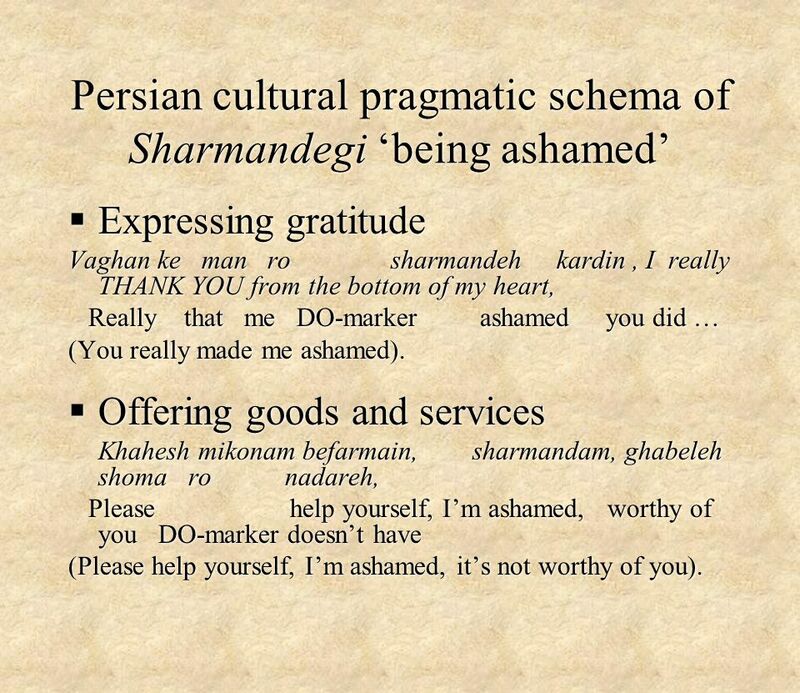 4 Persian cultural pragmatic schema of Sharmandegi ‘being ashamed’  Expressing gratitude Vaghan ke man ro sharmandeh kardin, I really THANK YOU from the bottom of my heart, Really that me DO-marker ashamed you did … (You really made me ashamed). 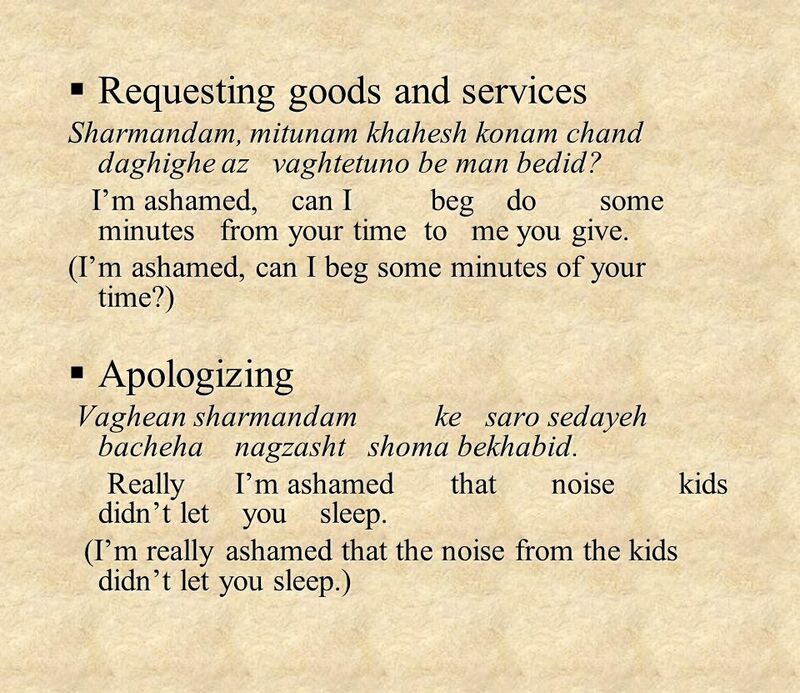  Offering goods and services Khahesh mikonam befarmain, sharmandam, ghabeleh shoma ro nadareh, Please help yourself, I’m ashamed, worthy of you DO-marker doesn’t have (Please help yourself, I’m ashamed, it’s not worthy of you). 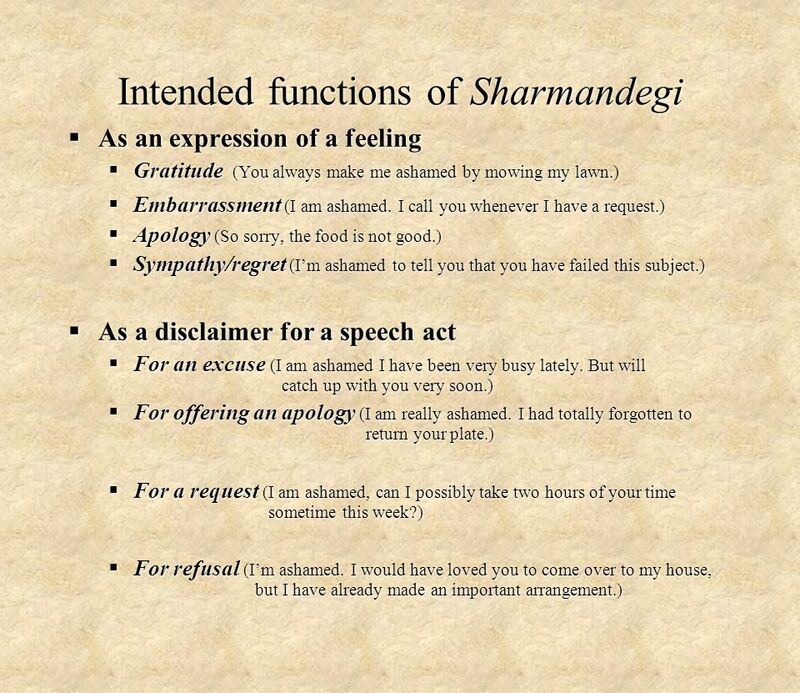  Expressing gratitude Vaghan ke man ro sharmandeh kardin, I really THANK YOU from the bottom of my heart, Really that me DO-marker ashamed you did … (You really made me ashamed). 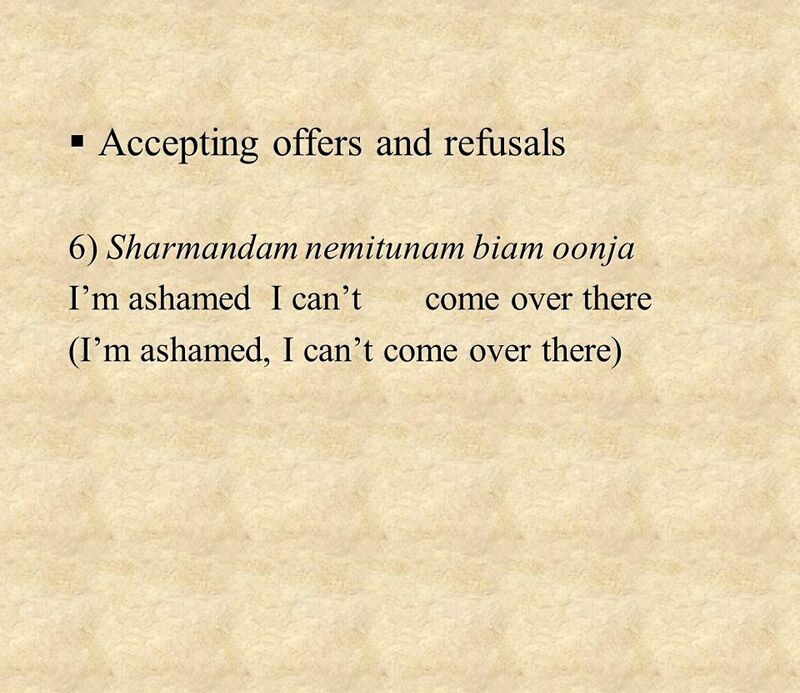  Offering goods and services Khahesh mikonam befarmain, sharmandam, ghabeleh shoma ro nadareh, Please help yourself, I’m ashamed, worthy of you DO-marker doesn’t have (Please help yourself, I’m ashamed, it’s not worthy of you). 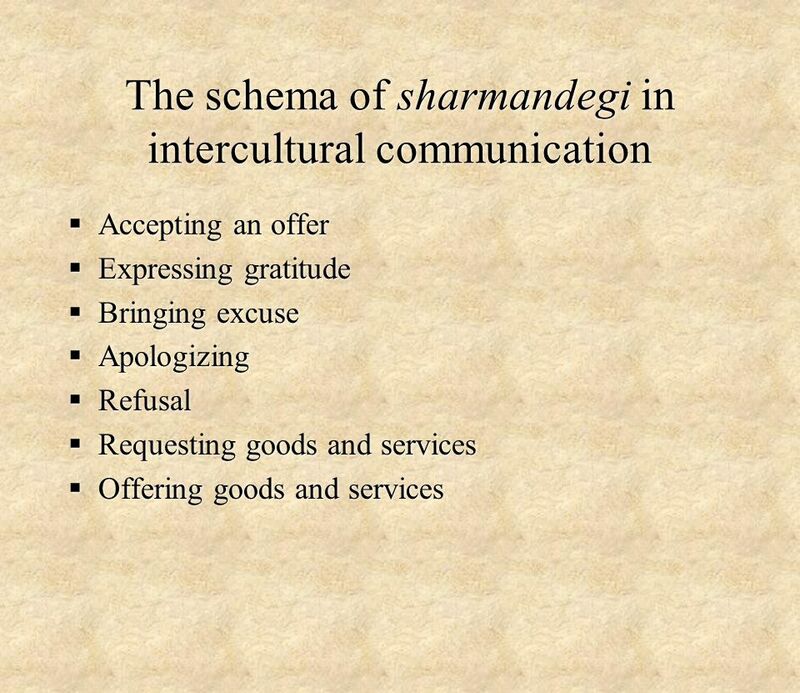 7 The schema of sharmandegi  The overarching schema of sharmandegi encourages Iranian speakers to be very much conscious of the imbalances in their give-and- takes in daily social interactions. 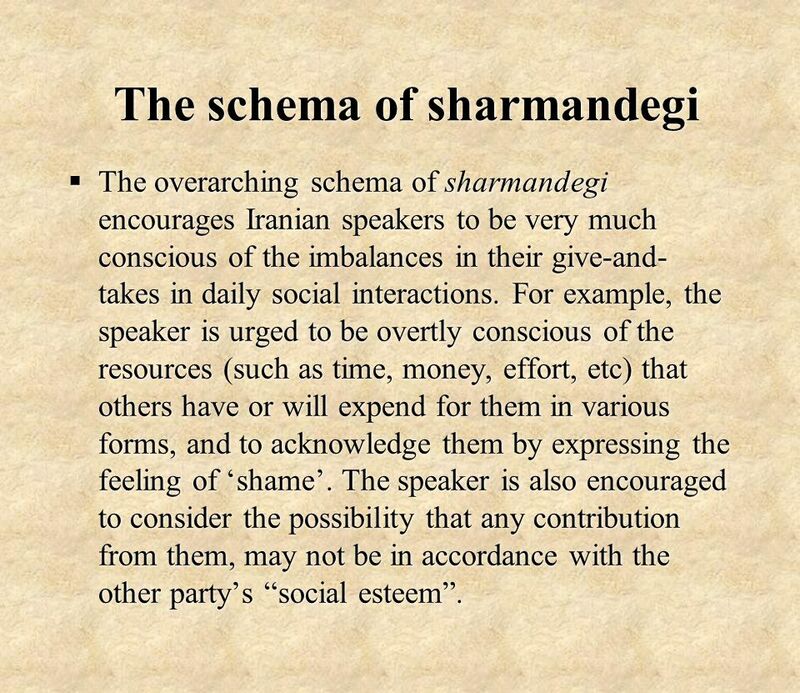 For example, the speaker is urged to be overtly conscious of the resources (such as time, money, effort, etc) that others have or will expend for them in various forms, and to acknowledge them by expressing the feeling of ‘shame’. The speaker is also encouraged to consider the possibility that any contribution from them, may not be in accordance with the other party’s “social esteem”. 14 Roya tells her neighbor who mows her front lawn voluntarily: “ You always make me ashamed by mowing my lawn ”, and the neighbor stops doing so. 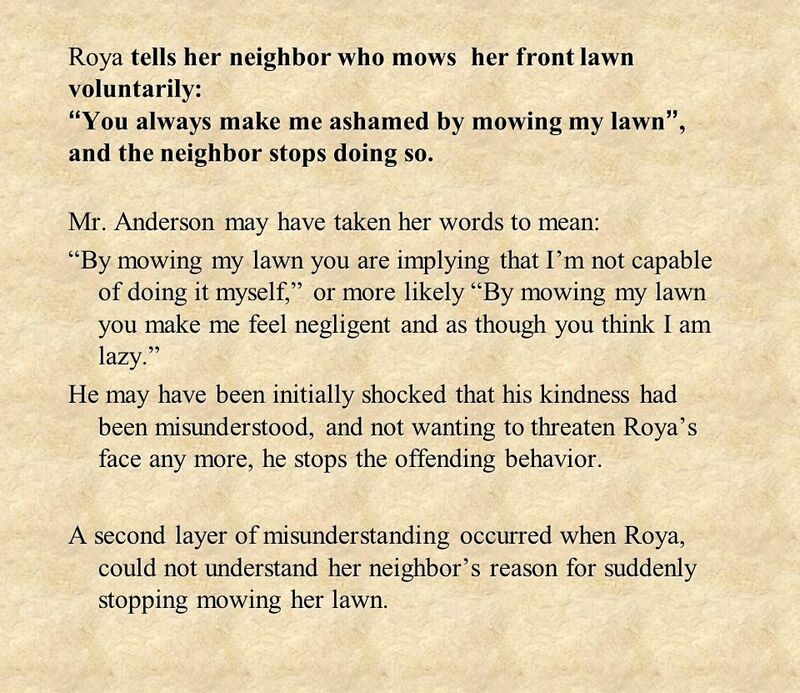 Mr. Anderson may have taken her words to mean: “By mowing my lawn you are implying that I’m not capable of doing it myself,” or more likely “By mowing my lawn you make me feel negligent and as though you think I am lazy.” He may have been initially shocked that his kindness had been misunderstood, and not wanting to threaten Roya’s face any more, he stops the offending behavior. A second layer of misunderstanding occurred when Roya, could not understand her neighbor’s reason for suddenly stopping mowing her lawn. Mr. Anderson may have taken her words to mean: “By mowing my lawn you are implying that I’m not capable of doing it myself,” or more likely “By mowing my lawn you make me feel negligent and as though you think I am lazy.” He may have been initially shocked that his kindness had been misunderstood, and not wanting to threaten Roya’s face any more, he stops the offending behavior. A second layer of misunderstanding occurred when Roya, could not understand her neighbor’s reason for suddenly stopping mowing her lawn. 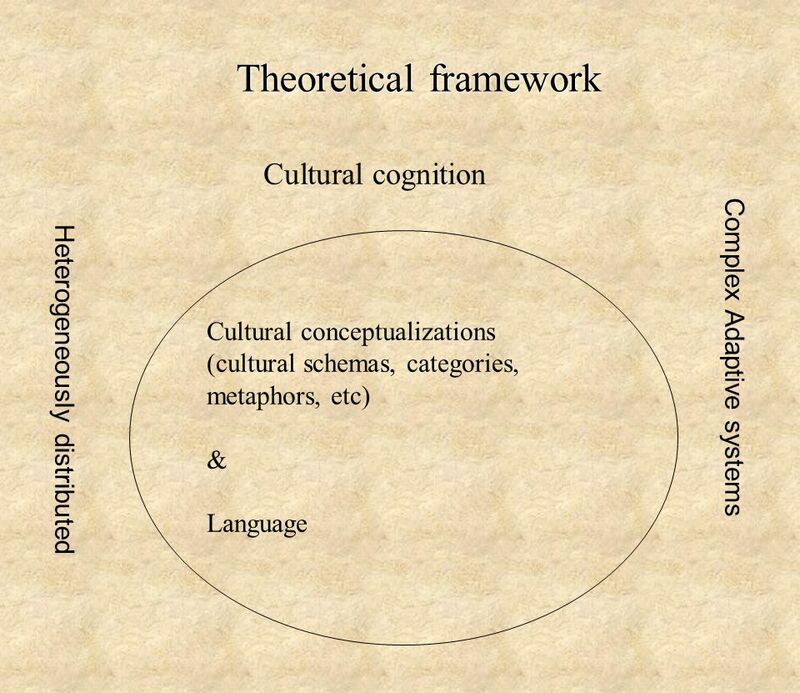 16 Conclusion  The findings of this study suggest that the framework of cultural conceptualizations and analytical tools such as cultural schema provide a strong perspective for studies of intercultural communication. 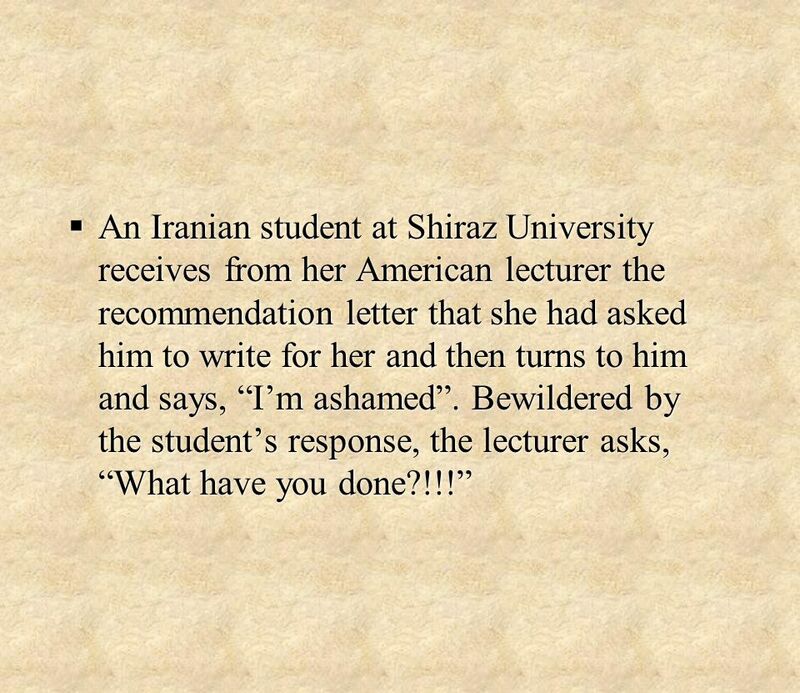  Viewing cultural conceptualizations as heterogeneously distributed among the members of a cultural group would be beneficial in avoiding the dangers of the development of stereotypes and overgeneralizations. 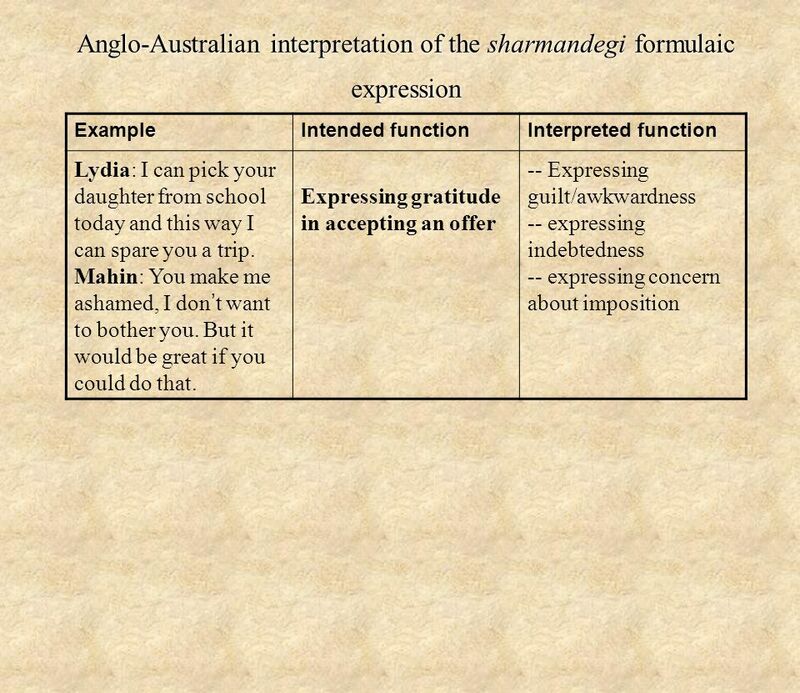  The findings of this study suggest that the framework of cultural conceptualizations and analytical tools such as cultural schema provide a strong perspective for studies of intercultural communication. 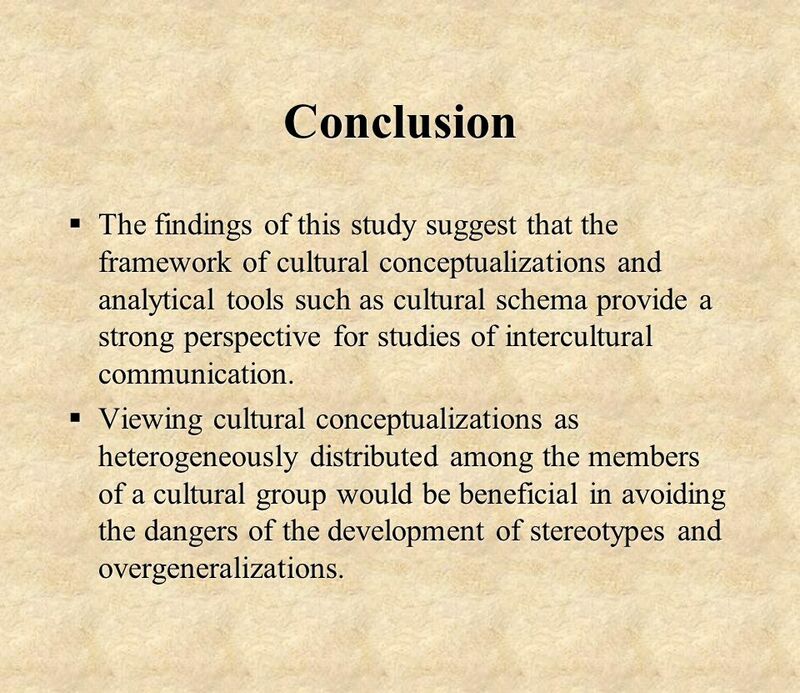  Viewing cultural conceptualizations as heterogeneously distributed among the members of a cultural group would be beneficial in avoiding the dangers of the development of stereotypes and overgeneralizations. 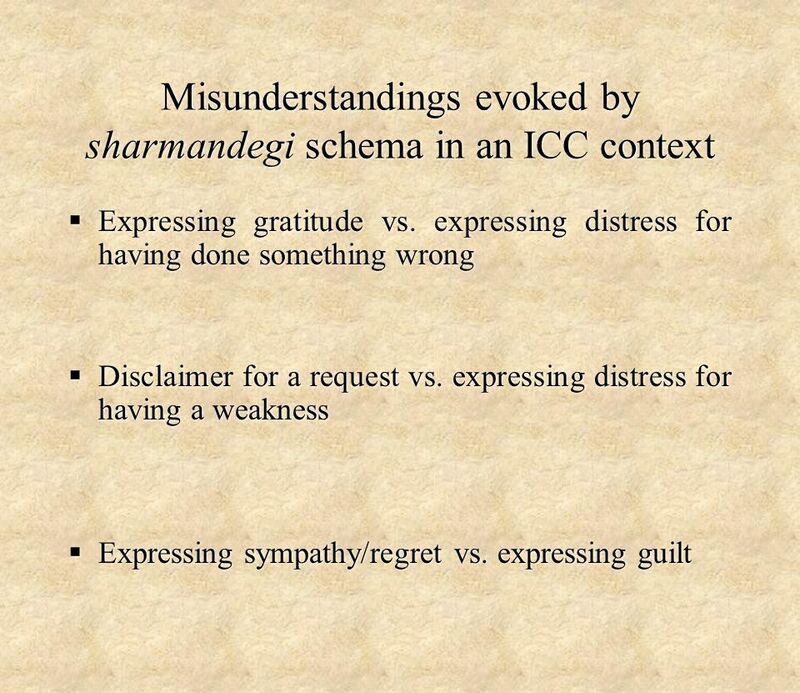 Download ppt "Cultural schemas in ICC: A study of Persian cultural schema of sharmandegi ‘being ashamed’ Farzad Sharifian Maryam Jamarani Farzad Sharifian Maryam Jamarani." Unit | Two Saying Thanks or Sorry. Using Positive Language January 2007, Alex Righolt. FAILURE IS A PREREQUISITE Demeterius “FLITE” Smith New Directions In Student Development Conference Friday, March 7, 2014 Piedmont Technical College. 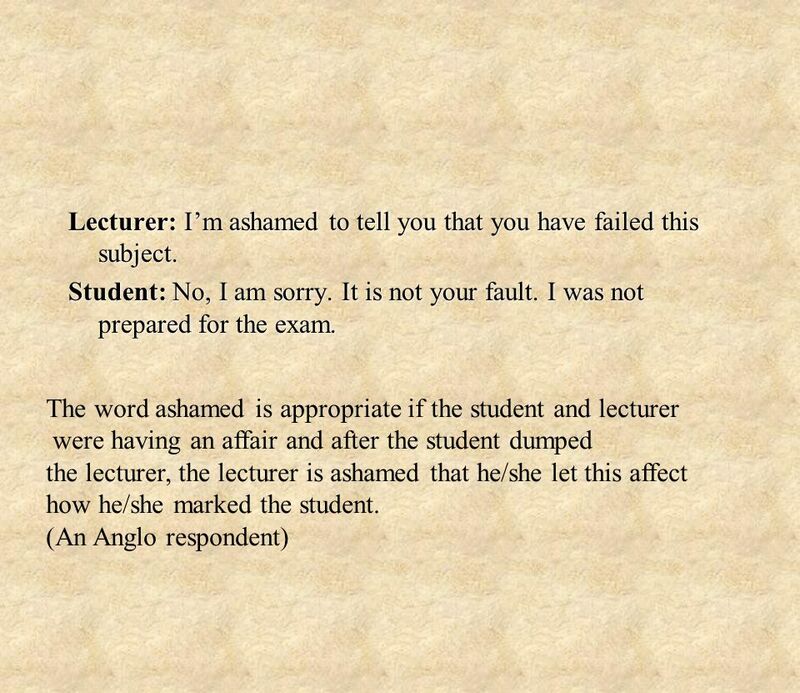 Conflict Management Dr. Monika Renard Associate Professor, Management College of Business. Raising Jairus’ Daughter. The Lord Jesus Christ healed many people because He desires to help all, young and old. Matching the saying with the right action WARM - UP.